More of a pet peeve than anything else, I cringe whenever I see a store owner use valuable advertising space within stores to lazily display social media icons. I am a big proponent of brands advocating their social media presence, but merely displaying icons will not only confuse your audience, but prove to be as effective as yelling at customers. (although yelling “Buy Now!” repeatedly could scare them into purchasing). Take the following example I saw earlier today (no offense to the store owner of this business). Can you spot the issue in the case above? 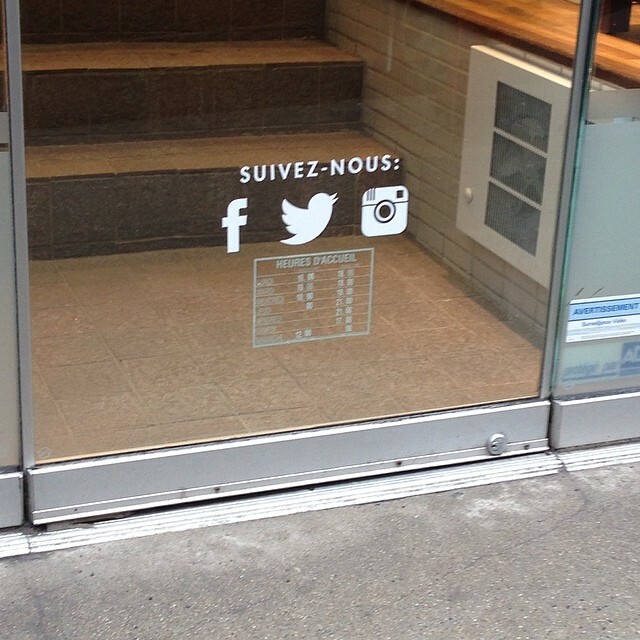 People walking past the store are asked to follow the company on Facebook, Twitter, and Instagram- that’s normal. However, how are they supposed to find the business in question? Merely displaying the icons without any sort of link or even a QR code means you are asking users to spend valuable time trying to find you on those platforms. If your business has a common name, or if your store is part of a national chain, it will become even harder for people to find your social media profiles. Display the full link and/or username for your profiles. “Facebook.com/MyStore” is easier to find and more distinguishable for users walking by. You can even use the logo and simple add the username, such as “FB/MyStore”. Provide a link to your website. The ultimate goal of social media marketing for businesses is to drive sales, so why not encourage users to visit your website? Odds are you have links to your social media profiles on your website already, so make it easy for potential customers to find you. Use QR codes. Even though adoption and usage rates for QR codes are pretty stagnant, chances are you’ll get a better reaction and actually drive users to your social media platforms. Nothing. Use that space for something else. Isn’t the ultimate goal of a storefront display to drive people into the store? Having social media icons on display won’t influence consumer perception in a mall. Use that space to promote specials and/or products. When it comes to complementing online and traditional marketing channels, business need to be more strategic in blending the two rather than creating a dissonance between different platforms. It’s also important to realize the ultimate objectives behind these actions, which will help guide you in implementing strategies effectively. How often do you see store owners randomly place social media icons without marketing messages/links? Discussion time: to display or not to display social media icons OFFline; as in on your storefront, car, sandwich board or at point of sale?